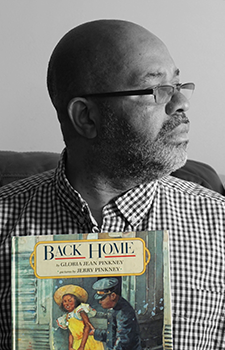 Back Home (Dial Books for Young Readers, 1992) is recommended for ages 3-8. Be sure to check out Ransome’s books: My Name Is Truth: The Life of Sojourner Truth, written by Ann Turner (Harper, 2015); and Grandaddy’s Turn, written by Michael S. Bandy and Eric Stien (Candlewick Press, 2015). If you are on Facebook, find James Ransome at Facebook.com/James-Ransome-Illustration.